Lady Liberty was getting tired. Try holding your hand aloft for nearly a hundred years and you’ll understand. The iron bars and rivets designed to support her welcoming arm were corroding, buckling and warping. Earlier restoration efforts were failing, and an application of coal tar paint was harming the distinctive patina of her copper skin. 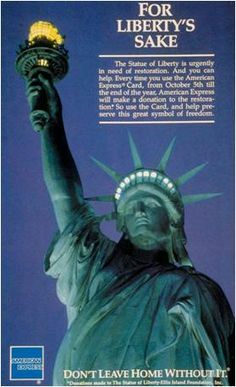 To prevent further deterioration, a major effort was started in 1983 to restore the Statue of Liberty and preserve it for another centennial. Enter American Express. The credit card giant launched a very public campaign to donate 1 cent for every credit card transaction and $1 for each new account. The program raised $1.7 million for the restoration. In addition to the goodwill generated for the company, American Express enjoyed a 28% increase in card use and a 45% bump in new account applications. Cause marketing is ideal for helping personal care businesses stand out from competitors. Some businesses are so prevalent in every neighborhood that they can often appear as interchangeable commodities, such as hair and nail salons, massage clinics and athletic clubs. Small businesses or franchises with limited marketing budgets look to cause marketing as a cost-effective way to do good and gain positive exposure. The premise supporting cause marketing is simple. Commonly, a business aligns itself with a non-profit entity and promises to donate a set amount or percent of purchases to the charity. If all goes well, the charity realizes a financial windfall, while the supporting business gains significant media exposure and increased customers and revenue. Philosophy: The skin and bath products company donates 1% of all USA net product sales to support community-based mental health efforts. Dove: The beauty brand’s groundbreaking Real Beauty social advocacy campaign continues to draw attention to how women’s bodies have traditionally been depicted in advertising. Dawn: The dishwashing liquid is well known for donations in support of International Bird Rescue and The Marine Mammal Center. Hopefully, businesses choose cause marketing out of a sense of civic duty and to help the less fortunate—more on this below. It makes tremendous business sense, as well. A 2014 Nielsen study found that shoppers want to patronize businesses seen as socially responsible. Globally, 55% of online consumers “say they are willing to pay more for products and services provided by companies that are committed to positive social and environmental impact.” In North America, that number is 42%. Businesses face a delicate balance when demonstrating their social chops via a cause marketing program. It’s a slippery slope to good community citizenship. Here’s some of the elements businesses should consider before establishing a public partnership with a non-profit entity. Choose Wisely—It’s important that the chosen charity be at least modestly aligned with the business category. There should be an apparent reason why a specific entity was selected. A hair salon might choose the Women’s Hair Loss Project. A weight loss clinic could support the National Eating Disorders Association. The Challenged Athletes Foundation would be a good fit for a fitness club. Give Meaningfully—If your company gives too little, you might generate bad press. One national food chain gives 0.13% of purchases toward a worthy cause. While the dollars have added up—the company has already given away grants in excess of $24 million—the small and strangely specific percent has raised eyebrows. Promote Tastefully—On the other hand, as long as you do so in a respectful manner, your business should feel comfortable in promoting its selected social cause. Perhaps a page on your website. News releases, store signage and kick-off events are all appropriate. Be Transparent—As with most financial matters, businesses should be forthcoming about their giving and where the money goes. Indeed, the money originates with consumers who patronize the business. Customers who don’t have faith in a company’s charitable activities may well look elsewhere. Get Employees Involved—Businesses will miss an opportunity if charitable programs don’t extend to their employees, who are on the front line of consumer engagement. Allow employees opportunities to personally give via payroll deduction, and provide other ways for them to participate, such as volunteering at charity functions. Your multiple locations can create friendly contests to see which store can raise the most money. Charity Should Reciprocate—Corporate giving isn’t a one-way street. Your selected charity should tastefully promote your efforts on its website, newsletters and email communications. This is not only a way the charity can thank you, but it also will serve them well. The more they promote the program, the more consumers may buy your products and services, which in turn will increase donations. Mahatma Gandhi observed that generosity is "not the sum given, but the manner in which it is bestowed." If your company’s heart is in the right place and you practice strategic and measured public relations, joining with a charity can pay spiritual and tangible dividends. Courtesy of PR News, here’s how to get started with effective cause marketing. Changing real people: The most effective efforts strive to get real people, not a vague segment, to change their behavior rather than giving a dollar at the checkout. Authenticity rules: Anything falsely designed and administered is poorly received, attracts the wrong attention and dies a quick death. Abolish the campaign mindset: The best cause marketing programs take place over time and are constant in purpose, even when the mechanics and activities change to ensure relevance. Avoid the big bang: Some marketers love to sign celebrities and hold big events. While they are exciting and noteworthy, they are quickly forgotten and questionable in long-term impact. Strive for loyalty: The best programs have people coming back because they recognize the benefits. This rewards both the cause and brands with loyalty and advocacy. Involve employees: It makes sense to motivate the workforce. Employees should be made an active part of the program from the outset. Have a plan B: Some cause-marketing programs backfire. It’s important to anticipate potential negative or apathetic reaction. Like anything in business, it requires investment, energy, creativity and experimentation to be successful.